A few of you may remember me, and I'm thinking most of you won't know me. I browsed around and saw a few names that were here 6-9 years ago when I was an active member. I'll get to it then. I'm shocked I was able to use my original handle actually. 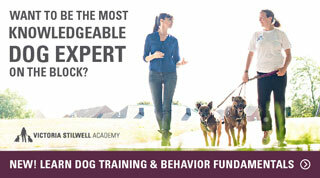 I go by Noobs, so called because when I joined this forum 9 years ago I was a "newbie" at dog training. (Get it? Ha. Oy.) I live in NYC with my family, which includes a boy who turns 6 tomorrow. We decided as a family that we are ready to add a pup to our household. We made our boy wait almost two years before we finally started looking around, and Saturday morning after a whirlwind application, we picked up our new friend after he was driven from TN up the east coast by a rescue organization. We had about 36 hours' notice so we had to run around like crazy to get the minimum supplies needed (crate, bed, food, some toys). We've renamed his Gus. Short for Augustus. And we love him. The rescue and foster family guesses he is 14-16 weeks old. He was apparently found with his sister suffering from mange. He was with his foster family for 6 weeks while they took care of him and his coat. They found him to be friendly to everyone, and he lived with a girl who is only days older than our son, plus her 10-year-old sibling, and two big dogs. They have a huge yard so hadn't really walked him until a week before we got him. Surprisingly he is great on leash! We are gauging how much walking he can handle at a time. We're sticking close to the 5 minutes per month of age rule. 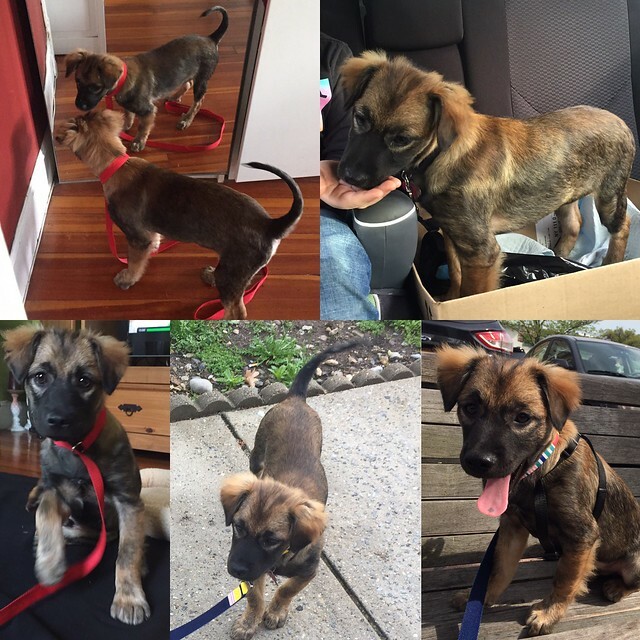 The adoption agency thinks he's an Australian Shepard mix with some Dachshund (his sister has short legs!). But take a look at the pics and you tell me! It's been quite a whirlwind for our little guy, as he spent Friday and overnight on a truck with dozens of barking dogs on what must have been a 14-hour drive. We picked him up Saturday morning and put him in another unfamiliar vehicle for another hour, and he spent Saturday getting familiar with our home, found his favorite room (my son's), got acquainted with his new crate, bed, and toys, and walking around a 3-4 block radius around our home. I've found he's not afraid of much. Loud construction and being under the train tracks when a loud train rumbles by. When he sees unusual-looking people approaching (usually that simply means someone carrying bags - weird appendages!) he stops and looks, watches them pass (this is the point where I praise and talk excitedly about how he just watched a person go by), and goes on walking with a verbal "let's go" reminder. Some of you know what I went through with Murphy so I worry that I'm overreacting but I am not sure yet whether that is a sign that he might react in the future. We don't know yet what motivates him so we haven't started any kind of treat rewards. But when he saw a cat pass in front of him last night he just watched it go and I almost cried. Again if you knew my story with Murphy you'd understand. Sunday we threw a birthday party for River; he turns 6 tomorrow. 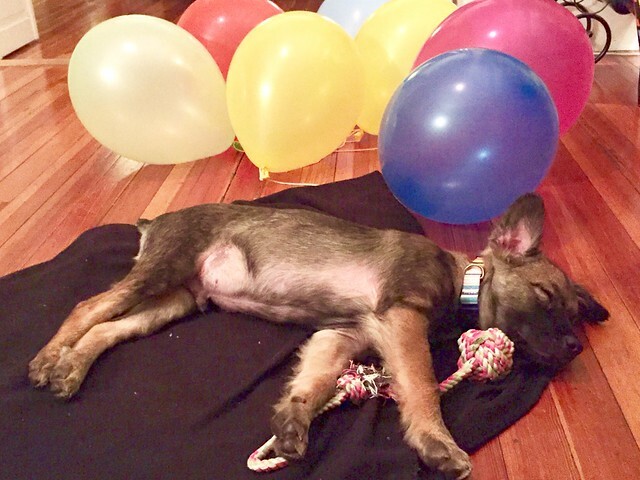 He had given up a having a big party with lots of kids so that we could afford to adopt the dog and buy his first round of supplies. So we only had 3 kids over, but 15 adults. Gus handled it so well. He approached people when he wanted to and walked away from people when he didn't want to greet them. But everyone was very patient and no one tried to force him into anything. He went into his crate on his own when the crowds got to be too much. He only emerged whenever River was in his sight line. 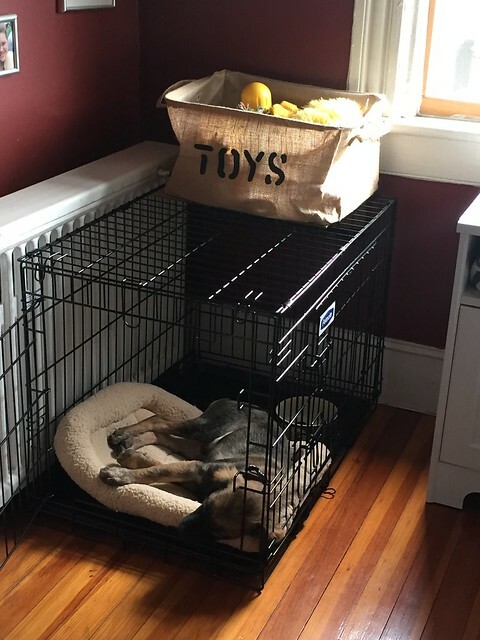 We just had to make sure the kids (who were understandably excited) didn't crowd around his crate and they understood that it was his safe space. He's had a few accidents in the house but only due to our negligence. He's been napping A LOT after 15-20 minute walks and after he goes to potty after waking up. He has a playful streak, and being his size it's fine (for now) for him to gallop around the house. Did I mention the agency thinks he'll grow to 40 lbs max? He's slept through the night since being here. Fosters said 10pm-5am, but at our place it's been more like 10:30pm-6am which is great! He seems to like picking up rocks and sticks on walks, so we're going to be working on "leave it" and "drop" for sure! He's already worked out "sit" and "down" on his own so I started using hand signals for those already. He doesn't quite know his name yet so we haven't worked on recall. We have spent some time talking to River about dog ownership, and things we need to do to make the dog happy. He's been very good about praising Gus every time he sits, even when he isn't asked to. He praises in a high pitched voice which I think is so funny and cute. He compliments Gus a lot: "Who's a good dog? You are! Who's the handsomest boy? You are!" He has even asked us to let him get up earlier so that he can take Gus on his morning walks with me. 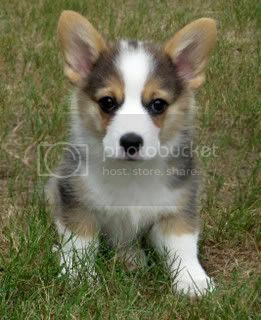 A couple of questions, as I haven't owned a puppy this young since I was a child and my family did everything wrong. - He's teething so is chewing the house down. We're working on it! But I want to know, how much can I do when playing with his rope (pictured below)? I don't tug very hard. Whenever he catches it in his mouth I pull it a little and if he's got a good hold on it I don't try to pull harder. Should I be doing that at all? Well he's only been with us a few days so there's not much else to tell. He's already quite attached to his little human boy, and vice versa. We are looking forward to watching their friendship develop. Last edited by Noobs on Thu May 04, 2017 1:55 pm, edited 2 times in total. Hi Noobs I remember seeing you around, I think we overlapped by a few months. Good to see you back again. Your new addition is adorable! With the tugging on the rope toy, is it his teeth you're worried about, or his neck muscles, rather than whether it's good for him behaviourally? I would imagine that jumping onto the bed would be OK for his joints as it's a soft landing, but jumping off best avoided as much as possible. Maybe you could lay a spare mattress or other padded surface next to the bed? I remember when Jasper was young we pulled the seat cushions off one sofa and put them on the floor in front of it. But it's practically impossible from stopping a pup leaping around the place so it's just a case of doing what you can. I can't believe it's been six years! Welcome back and wishing you all the best with your new pup. He is a cutie pie! I'm just worried about whether he's too young for tugging that's too strenuous, and whether it might harm his teeth. Right now I'm tugging just enough for him to want to hang on to it, and when he tugs harder than I'm comfortable with (again, for his teeth and physical development only), then I let him "win" and let go. I'm not worried about it behaviorally. I am looking forward to having tug games with him when he's more grown. And I remember you, too, Judy. Hi! Oh he's cute! Six years-- time flies, doesn't it? It's great to hear from you. If an opportunity comes to you in life, say yes first, even if you don't know how to do it. Thank you, Fundog and Suzette. I'm starting to think he has some type of bird dog in him. He really perks up and zones in on birds on our walks, but nothing else. OMG SIX YEARS! Welcome baaaaaaaaaaaack! Get cracking finding out what his ideal food reward is, because you must must must pair the experiences out and about (and at home) with that high value reinforcer to create a positive association. At this age it is typical that they will just watch stuff going on around them, but unless they form that positive association, ie, get treats, then when they come BACK to that experience later on, effectively the doggy mind database has 'no entry' for that thing, rather than 'oh yeah thats good'. He is super super cute, can't wait to hear more about him and how you guys are getting on! We've missed ya! Thanks, Em, for the welcome and especially for the tip on positive association. Right now he goes nuts over ham, as L was making a casserole for a school function the other day and he flipped out over the smell and taste. I'm afraid he likes it to the point of distraction though so we're gonna have to pull back and try chicken which isnt as strong smelling. This morning a plumber came to our apt to work on our kitchen sink and Gus was absolutely unfazed. Last night we passed our local church a few minutes before a gathering, 4 people out front whom he completely enjoyed receiving belly scratches from. The crowd rapidly grew to almost 20 before I knew it. Again he was unfazed and enjoyed all the attention. When he was done he simply walked away from everyone. And literally as I'm writing this on my phone, we are at R's taekwondo class. There are kids everywhere, it's loud and chaotic. He's sitting in his little bag between my feet and is so relaxed he fell asleep. I want to cry over this daily. It's such a different experience for me. Typical me - I find this after I have contributed to your other threads! Six years. Wow. Good to have you back. I used folded old duvets (given by friends or cheapest sort to buy) under any surfaces my pups were likely to jump off. Also if you drive him places, teach him to wait until you lift him out of the car. Go easy on the ham because of the salt. He looks a very attractive pup and sounds to be a cool dude. It is so strange for me to come here and not need to ask advice on any issues. I only have questions on normal puppy development. What a relief! I'm glad these boards are still here. Good people, you are. I am sooooo happy you have a dog again. can't wait to hear more about how he develops and the adventure of raising your pup.